BBC Proms | Music Matters | Because it does. Doesn't it ? It’s almost hard to believe that this year is not just the centenary of Cage’s birth, but also the sixtieth anniversary of Cage’s noiseless yet sound-rich, notorious masterpiece, 4’ 33’’. 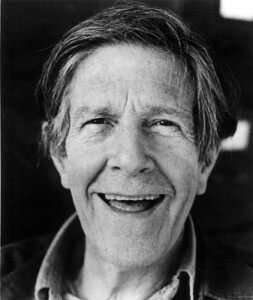 Premièred by David Tudor on August 29 in 1952, the piece has gone on to cause controversy wherever and whenever it continues to be performed. The BBC Symphony Orchestra performed the UK’s first orchestral version of the piece in a concert dedicated to the music of Cage in 2004. Cage’s piece draws to the fore the interaction between performer, audience and environment, raising the significance of the non-directed elements present during the piece’s performance; ambient, unintentional noise, aleatoric sounds, events outside of the performer’s control and yet deliberately included as part of the experience. The piece makes room for all those surrounding elements over which the performer has no direct control, and makes them a part of it; it makes us listen not to an arranged series of controlled auditory events, but to whatever sonic incidents happen to occur during that defined time-period during which the piece is ‘performed.’ In fact, the only controlled element of the piece is the time during which these events unfold, defined by the raising and lowering of the piano lid in the piece’s original incarnation. Aside from dictating the beginning and end of each of the three movements, everything else is left to chance. Tuesday marked the centenary of Cage’s birthday, and there have been events marking the occasion worldwide throughout the year including a special BBC Prom dedicated to Cage’s work (for which the back-up system on Radio 3 had to be turned off, a system which kicks in when it detects ‘dead air;’) yet it’s 4’ 33’’ that remains his most notorious, most thought-provoking piece, and arguably one of the most significant works of the twentieth-century. For a piece with no prescribed sound, its impact continues to resonate still. For all the Fitkin fans amongst us, there’s a veritable Fitkin-fest on Radio 3 this week. From Monday, and on iPlayer until next Monday, there’s the chance to hear the London premiere of L, written as a present for and here also performed by cellist Yo-Yo Ma. 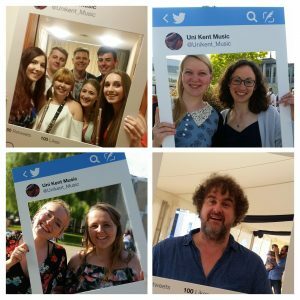 A previous post about Fitkin, including the chance to listen to some of his pieces, appeared on here back in February. A Fervent Feast from Radio 3: don’t miss. Remember how I went out with N.? How it was all lovely and picture-perfect, but neither of us really felt a spark? Well, seeing as we’re nearing our one-year anniversary of that date (and haven’t really been in touch since) we decided to repeat last year’s performance and go to the same outdoor festival. Now, I’m still not really in the market for dates, but this seemed to be more a reminiscent outing than anything else- we had a fun time watching a movie last year, so why not do it again. The organisation was very simple- after all, we’d done this date before. The only apparent problem was that on the day of the festival, it was raining like mad (what with it being August in London and all), and I couldn’t really see us sitting outside on the ground, huddling in the downpour, trying to keep the mud from seeping into our mats and blankets, all while balancing umbrellas, trying to see the screen and eating sushi. I guess you can see my priorities here. Either way, I proposed what I thought of as an excellent alternative to outdoor cinema: Prom 55. It has the same picnic + culture spirit as the original plan, but instead of in the rain, we’d sit in the Royal Albert Hall. I love opera, I love Handel, I love Handel operas- I was already completely sold on the idea. In a quick text, my date agreed and we settled where and when we’d meet. I spent half the afternoon researching Rinaldo, reading synopsis and interpretations and pre-listening to important arias online. I was positively giddy when I arrived at our meeting point. Also because I was curious to meet N. again. But yeah, mostly for meeting R.
Our pre-Prom queue banter quickly showed that N. hadn’t even realised he was going to a partially-staged opera performance instead of an orchestral concert. His face twitched slightly when he asked “Oh, with singing and everything?”- which should have warned me. However, I was in my own little bubble of enthusiasm and just replied “Yes, it’s going to be amazing!” instead of picking up on his scepticism. We got gallery tickets, and found space to sit near the bannisters about in the middle of the gallery. Excellent promming! We could see the entire stage, albeit through “prison bars” as my date charmingly put it, and I got even more excited. I was enthralled from the first notes of the ouverture (go listen to it here). Prom 55 was the Glyndebourne 2011 production of R. by Georg Friedrich Handel, where the Crusade Age plot is re-imagined as a revenge-fuelled school boy’s dream after he’s been bullied one time too many. Seeing as the original baroque opera’s plot is confusing at best, and racially, sexistically and religiously insensitive and bigotted at worst, I thought this was a clever choice(although on a whole the “transported in modern time through one thing or other” strategy isn’t my favourite staging tool) and overall, the transformation into a teenage fantasy worked for me. Sadistic teachers, wise teachers, mean girls, luring synchronised swimmers, armies of bicycle riders and football playing boys- R. filled his dream with some too-well-loved stereotypes and cliches along with some very bright ideas. While the latex-clad Armida as teacher with cane and posse of St Trinian lookalikes felt a bit heavy-handed for me, I found the reimagining of the final battle scene of christians and muslims as a slow-motion football game that ended with R. scoring into the orchestra simply ingenious. The Orchestra of Enlightenment was fantastic, and although I wasn’t entirely convinced by his harpsichord solos, I really liked Ottavio Dantone’s musical direction. The singers were spirited and lively, with Sonia Prina’s title role a special treat. You can tell, I adored it from the first minute. Poor N. really didn’t. He hadn’t read the plot beforehand, and my hastily whispered 45 second introduction to a story along the lines of “…and then A dresses up as B and her lover C falls in love with her in costume, so she plots revenge together with B’s lover D, who she has imprisoned earlier. Oh, and she’s a witch!” didn’t really enlighten him either. The Prom performance was not surtitled like most other foreign language opera performances (a decision I don’t understand), N. thus had hardly any chance to understand what was going on for the next two-and-a-half hours.We discussed our experiences in the first interval, and it became clear he had resigned to just listening and ignoring the plot completely. And although he was too polite to explicitly state it, it was quite obvious that baroque opera was not the music he would usually choose to listen to for an evening while sitting on the linoleum covered floor amidst a bunch of opera-fanatic strangers. This essentially gave me a choice to either a) be a very nice person, suggest to leave during the interval and get some drinks instead and spend some more quality time with X. or b) resist the social clues, stay for the rest of the opera and spend some more quality time with R.
I went with b). Because I truly fell in love with R. I’ve been obsessively listening to the recording over and over again in the past days. I’ve imagined our future, how I’ll buy the DVD when it comes out and how I’m going to go to all future Glyndebourne proms. I couldn’t wait to tell my friends, and just writing it down now makes me smile. N. took it very gracefully, and I promised him non-operatic drinks next week. (Read more from about our guest’s grappling with life on their own blog here). Composer in Focus, Now Hear This! Graham Fitkin‘s music first attracted my attention in 1998, when I came across an SPNM sampler disc containing a tantalising segment of Cud and a complete performance of Hook which all but took my head off. That was enough: bam, I was, well…hooked. I think I had those two pieces on the disc on repeat for the best part of a year, a blissful relationship only interrupted by my moving house and losing the disc. His music defies those neat genre-defining labels that critics and music shop stockists love: classical, minimalist, techno, jazz. Combining repetition, polyphonic rhythmic inventiveness, sampled and electronic sounds and a tonal language glittering with bright colours, it’s a music that refuses to be neatly pigeon-holed. I love the vibrancy of Hook; the driving rhythmic vitality, brash modern textural writing, and the sheer exuberance in the music that makes it infectious listening. Fervent. for solo piano, has a relentless energy to its ostinato-driven material. 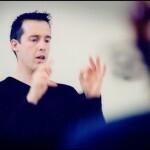 Last year, PK was commissioned for, and performed at, the BBC Proms; dealing with the first sending of Morse code signals from Porthcurno in Fitkin’s birthplace of Cornwall, the piece employs Morse code-inspired rhythms, blazing brass and big orchestral gestures occasionally reminiscent of John Adams’ Harmonielehre. Then there’s the contrasting intimacy of Skirting, for solo harp, with its evocative arabesques, or the bustling Vent for four clarinet or saxophone quartet. Then there’s the minimalist electronica of K2, from Kaplan, that could almost be something by Aphex Twin. Just listen to the way the music dances and shimmies in the advert for Uniqlo jeans: brief but utterly captivating, like much of Fitkin’s music there’s a wild urgency that cannot be denied, a delight in revelling in bright textures married to bold rhythmic gestures. It’s compulsive stuff that luxuriates in the sheer joy of music-making. Is it classical ? Is it minimalist ? Or post-minimalist ? Or jazz ? Electronica ? Or all of them, or perhaps none ? 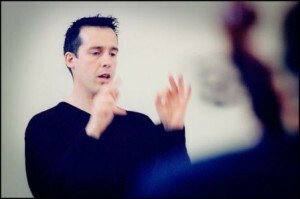 Who cares… Keep an ear out: a new piece by Fitkin is always worth waiting for. The two Proms from Friday night both employed the piano not as a percussion instrument, but as a weaver of illusions. In the first concert, Jean-Efflam Bavouzet gave a dazzling performance of Ravel’s often brooding Piano Concerto for the Left Hand, written between 1929-30, in which the piano part is so carefully constructed that, if you’d missed the title of the piece, you could be forgiven for not realising it was written for a single hand. Rather like the single instrumental voice in Bach’s solo partitas for cello and for violin, the single part executes both melody and accompaniment in a way which convinces the ear that there’s another part also involved. Ravel built the piano part so carefully that, when an arrangement was made for both hands, it actually destroyed the careful balancing and textural placing that Ravel had so diligently organised. The second, late-night Prom saw a very different piano concerto, Morton Feldman’s Piano and Orchestra of 1975, in which the piano explores distilled vertical sonorities, often at times either blending into or emerging out of the accompanying orchestral texture. John Tilbury’s delicately-balanced reading made the piano seem as though it were dripping dabs of colour into the surrounding air. Unlike the traditional concerto, which pitches the solo instrument against the orchestra and includes a solo cadenza to display the virtuosity of the instrument, here piano and orchestra are united in a sonic exploration, defeating time by eschewing the traditional three-movement structure and using instead a slow-moving, metre-less feel over a single movement. The sense of time pausing, of contemplative reflection and of the slow examination of ideas from several perspectives are concepts another Frenchman would have recognised – Satie’s Trois Gymnopédies achieve something similar in condensed form. 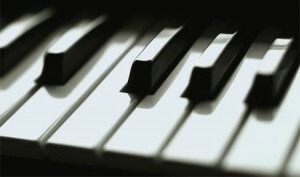 Working towards the end of the nineteenth and early twentieth centuries, Debussy talked of composing for the piano a ‘music without hammers.’ The piano is essentially a percussion instrument: rather than strings being bowed or plucked, they are struck with hammers, and you can’t get more percussive than that. It was Debussy who began the idea of treating the piano contrary to its essentially percussive nature, and Feldman’s piece stands in the tradition Debussy began nearly a century earlier. Two concerts, using the piano to weave two very different illusions: one to overcome the absence of a right-hand (I avoid the word ‘missing,’as the concerto certainly doesn’t suffer from the absence of the upper hand), and one to pretend the piano isn’t a piano at all. Would Debussy have approved of Ravel’s piano concerto, had he lived to hear it ? I feel certain he would have approved of the Feldman. (You can hear the concerts for a week on-line on BBC iPlayer, and the concerts will be repeated on Radio 3 later next week). Not so singing and dancing at the Prom? There’s been some discussion amongst friends and acquaintances since last night’s Prom celebrating Stephen Sondheim’s eightieth birthday, which was also broadcast on BBC2. Much debate has centred upon Dame Judi Dench’s performance of Send in the Clowns (which, for my money, is the piece which would alone guarantee Sondheim’s place amongst Song-Writing Immortals, even if he hadn’t written another note). Dame Judi is not, and nor does she pretend to be, a singer. She didn’t sing the song particularly well, which prompted heated discussion. But she performed it brilliantly. That’s what she does. She delivered an evocative, moving performance of the song that captured the spirit and emotional intensity of the song in a way that commanded the attention. Ok, her singing might not have been first-class, but that wasn’t why she was there: she was there to perform the song, which she did. Fantastically. And then there was Bryn. He delivered a colossal performance of part of Sweeney Todd that pretty much knocked everyone else’s singing into a cocked hat: the sheer physicality, charged gaze and demonstrative gestures meant he dominated the stage and had total authority: he didn’t just sing the part, he was the part. The Heated Discussion resumed when he came on to sing and dance in part of Everybody Ought To Have A Maid. Of course, Bryn isn’t the most light-footed, gazelle-like creature, and suddenly the same voices debating Dench’s singing were chattering about Bryn’s dancing. But Bryn’s efforts didn’t matter: he doesn’t aspire to be a dancer, and it was a light-hearted moment in which he good-naturedly joined in, which contrasted with the demonic performance he had just given as the Demon Barber. People don’t go to hear Judi Dench sing, or Bryn Terfel dance: they go to see them perform. And perform they did – two contrasting pieces, one moving, one menacing. Had they gone to a vocal masterclass by the Dame, or a dancing lesson from Bryn, they might have cause: but it was a Prom concert, where performance is meant sometimes to be diverse and theatrical. Anyone who grumbles about it will perhaps have missed the point. Ahhhh: with only a week to go until the BBC Proms season begins, it’s time to start getting excited. 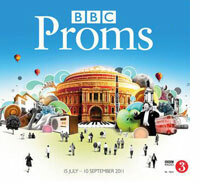 With every concert broadcast on Radio 3, and some of them televised on BBC4 (mainly) and BBC2, it’s possible to enjoy Prom season even if you’re not living in, or planning to go to, London. If the excitement’s almost too much, then you can alleviate it slightly by browsing the new BBC Proms Archive, a veritable treasure-trove of information, covering every single Prom performance since Sir Henry Wood first stepped up to the podium in 1895. That’s 115 years’ worth of music-making, catalogued for users to explore. I’m sure cultural historians are drooling at the prospect of being able to discern listening trends, composer popularity and how tastes in music have changed over the years; viewers can trace how often a work has been performed, who is the most-often performed composer (answer: Wagner – personal acquaintances of mine will know my reaction to that! ), and see how the vogue for particular pieces and composers has ebbed and flowed over the years. It’s one way of distracting yourself from the excitement of waiting for this year’s season to get underway, especially since England’s departure from the World Cup. In the meantime, vintage footage of Sir Henry Wood in action to tide you over until a week on Friday.